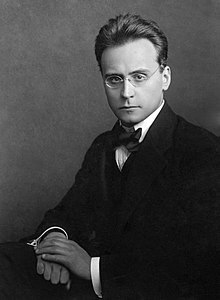 Anton von Webern (3 December 1883 – 15 September 1945) was an Austrian composer of atonal music. Webern attracts me, though there's a lot that I don't understand. His music is a combination of purity, complexity and abstraction in the very best sense of the term. "[the impression of the first time I heard Webern's music in a concert performance] was the same as I was to experience a few years later when I first laid eyes on a Mondriaan canvas...: those things, of which I had acquired an extremely intimate knowledge, came across as crude and unfinished when seen in reality"
This page was last edited on 10 April 2018, at 17:29.